Passengers is an art-house science fiction movie that somehow got made by a major studio with A-list stars. The film owes more to castaway stories than traditional spacefaring tales and, at least during the first half, it's ripe with existential angst. 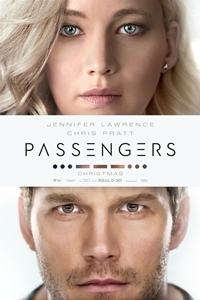 Passengers isn't afraid to venture into dark territory; a choice made by the main character could charitably be considered morally dubious. Nevertheless, as questionable as his actions may be, they are entirely human and are handled with tact by director Morten Tyldum (The Imitation Game, for which he was Oscar-nominated). The movie's failings come during its final act when contrivances and an adherence to big budget conventions transform Passengers into a less compelling experience than what it starts out as. This review will contain spoilers. It's impossible to write intelligently about the film without giving a few things away. The action transpires sometime in the distant future. No date is given but, based on the level of technology, it's closer to Star Trek than modern day. On board the Homestead II spaceship, 5000 passengers and 200+ crew members are in cryogenic sleep for a 120-year voyage to a distant colony. The ship, which is like a Titanic in space (unsinkable), encounters difficulties when it collides with an asteroid. One sleep pod malfunctions and mechanic Jim Preston (Chris Pratt) finds himself alone and awake 90 years before the ship reaches its destination. He spends one year trying to find a way to improve his situation but learns there's no way for him to go back to sleep. He will die of old age before the ship reaches the planet or anyone else awakens. If he wants to salve his loneliness, he will have to wake someone else up. Initially, Jim resists the impulse. But he is drawn to one woman, writer Aurora Lane (Jennifer Lawrence), and begins a form of stalking. He watches videos she has made and reads everything she has written. As the months go by, Jim becomes increasingly unstable, even considering suicide. Finally, he takes the decisive action to awaken Aurora, thereby condemning her to the same limbo existence he is enduring. He pretends it's an accident. For a while, she believes him. Jim is deeply flawed but the script goes to great lengths to present his actions sympathetically. Passengers doesn't ask viewers to agree with what he does but it allows us to understand the state of desperation that leads him to act. In his situation, can any of us say with certainty we would ignore the constant temptation of companionship and live out our remaining 50 or 60 years in isolation, with only a bartender android named Arthur (Michael Sheen) as a companion? Once Aurora is conscious, the movie plays out like a romance. These two mismatched souls are understandably drawn together. Once she acknowledges that her hopes and dreams have been shattered, she allows herself to fall in love with Jim. For his part, he basks in the glow of her presence but guilt gnaws at him. The secret eventually comes out (although the manner of its revelation is one of several facile screenwriting shortcuts that diminish Passengers) and the results are predictably devastating. It almost feels like the final 40 minutes were written by someone other than the man who penned the first 75. They are clumsy and the character-based focus of the early sequences is swapped out for clichéd "save the ship" action-oriented scenes. A deck officer (played by Laurence Fishburne) briefly appears to move the narrative in a specific direction and provide an exposition dump. Sadly, much of what Passengers accomplishes using sound and fury could have been achieved through less ostentatious, more satisfying means. Chris Pratt and Jennifer Lawrence make a strong couple. They have good chemistry and Lawrence is able to plumb the conflicting emotions that drive Aurora. Imagine waking up a and realizing your life as you envisioned it is gone and the only other person you'll ever know is this rugged stranger? Then, after having accepted things and fallen hopelessly in love him, you learn of his betrayal? Pratt, for his part, is much better when working with another actor. His "alone scenes" lack the depth of emotion and introspection we have seen from performers like Sam Rockwell (Moon), Tom Hanks (Cast Away), or Matt Damon (The Martian). Part of the marketing problem for Passengers is that it's difficult to classify. It is science fiction but lacks the Star Wars-flavored action audiences have come to expect. It's a romance but the love story is at times uncomfortable. Early on, the film's pace is slow (an asset, in my opinion, but some will find it boring) but aspects of the final act seem as rushed as they are unlikely. Passengers is an odd movie but its central questions and dilemmas are compelling and there's enough here of substance for the impressions to linger. Problems aside, it's a journey worth taking.